As some of you know, the Cap'n has never been what you would call the biggest fan on the Saw films. In fact, I aggressively avoided most of the sequels when they played in theatres and, for quite a while, when they hit DVD / Blu-Ray. I watched the first film, which was bloody but not very good, and then the second film, which was just not very good, and called it a day. I'd read the spoilers for the subsequent films and listen to friends cackle at how ridiculous the series' mythology became, but like the Paranormal Activity movies, I didn't feel and overwhelming desire to watch them myself. Then, because I was working on "What the Hell" week, designed to see movies I'd never otherwise watch, Saw VII landed in my lap. I thought it might be fun to watch the "last" movie in the saga completely out of context, and it turned out that I didn't really need to be up to date to follow what turns out to be a fairly generic concept in sequel production. While I don't necessarily regret having seen it, I did realize that Saw as a franchise didn't have much going for it. Still, it made the Cap'n wonder how the degree of absurd retconning to the story of Jigsaw happened, where the hell Mark Hoffman came from, and what other stupid plot twists I missed in the intervening chapters, so I watched Saw III, IV, V, and VI (the latter three in the span of two days), and I thought I'd share my findings with you. Today we'll start with the "first cycle" of Saw films, the ones where Jigsaw (Tobin Bell) is the direct antagonist, and later this week we'll take a look at the "second cycle" where the original Jigsaw is replaced by Lt. Mark Hoffman (Costas Mandylor) and the films become increasingly erratic in their attempts to bridge the characters together. 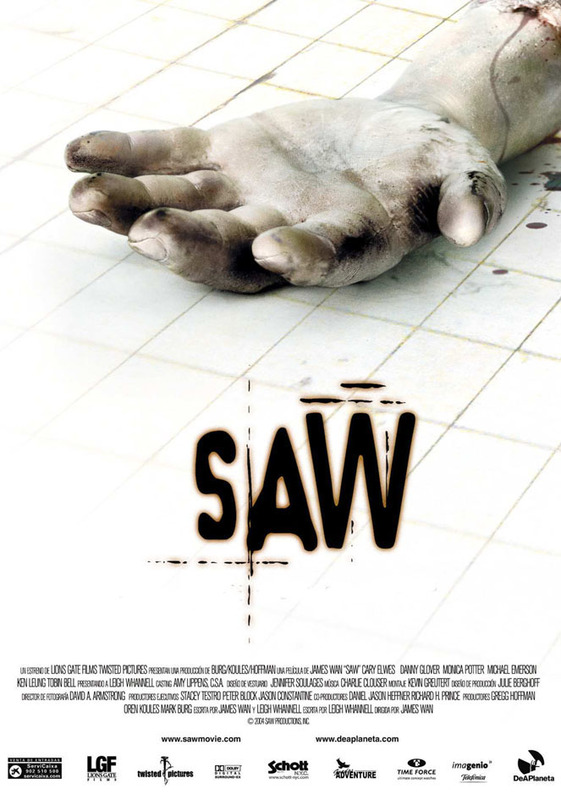 Let's begin with Saw, which seems to be a generic Seven rip-off with the added benefit of having two victims trying to escape one of Jigsaw's traps. The film begins with what would become a trademark of the series - a cold open introducing us to someone who wakes up in a seemingly inescapable "trap." A video with a puppet plays, prompting the victim to "live or die, make your choice" and in this instance a man must crawl through razor / barbed wire in order to escape. He bleeds to death halfway through, so we meet Detective David Tapp (Danny Glover), a man obsessed with catching the Jigsaw Killer. Along with his partner, Detective Steven Sing (Danny Leung), Tapp is moving in closer to the elusive killer, who never actually murders his victims, but forces them to do horrible things to themselves (or others) in order to survive, like Amanda (Shawnee Smith), who cut a man open to find the key to remove a contraption that would otherwise rip her jaw off. Anyway, knowing what I know now about how the rest of the series copies the worst parts of the first film (the "twist" with flashbacks, the hysterical overacting, the over-reliance on gore to cover up for lack of story logic, and persistent misdirection), I guess that Saw does the best job of it, in that we don't immediately know what's going to happen when the film starts, unlike Saw II. Speaking of Saw II, we meet Jigsaw as he's been captured and interrogated by Detective Eric Matthews (Donnie Wahlberg, replacing the definitely dead from part I Ken Leung and the probably dead or just wouldn't come back Danny Glover), a shrill, idiotic blowhard just begging to be part of Jigsaw's game. Luckily for him (and unluckily for us? ), Jigsaw allowed himself to be arrested in order to teach detective Matthews a lesson. See, the cancer stricken Jigsaw took Daniel, Eric's son, and placed him in a "game" with other lowlifes, including previous game survivor Amanda. If Matthews is willing to sit and watch the video feed from the house, then he will discover that Daniel is "quite safe," but since the films almost immediately drop off in quality, you can guess where this is going. 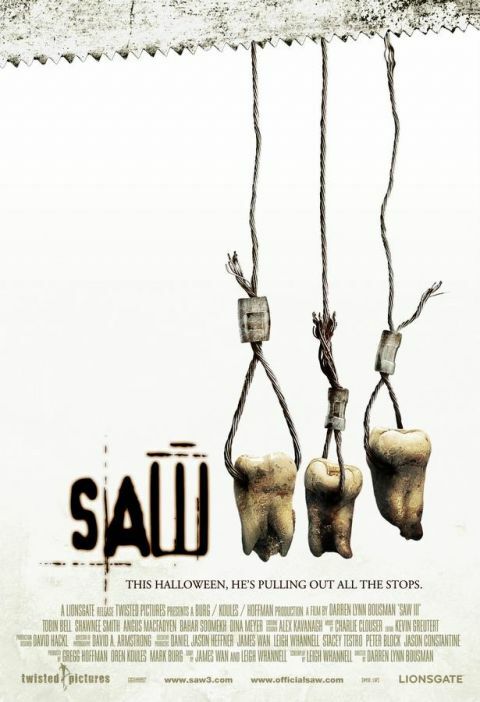 I will give Saw II credit for having a twist built around our expectations of the same parallel story-telling from the first film - the twist that the "game" isn't happening live, but is instead recorded footage, isn't as good as "the killer was in the room the whole time," but it does at least provide a better "bait and switch" than later chapters can offer. Tobin Bell is front and center as Kramer / Jigsaw, and he helps temper the grating performance by Wahlberg, who is so one-dimensionally stupid that I'm honestly amazed he has the good sense to do what Dr. Gordon didn't think of at the beginning of Saw III. Speaking of which, I guess the revelation that the "game" is happening in the same building where the first film took place is an okay idea, but now that the police are aware that it exists I find it really hard to believe Saw VII can end the way it does. The victims are mostly one dimensional, behave like morons, and die accordingly. I can't honestly say that I would behave in a wholly rational way if I found myself in their situation, but the persistently idiotic behavior, even after they've clearly had time to digest their dilemma, smacks of lazy writing. Instead of "how would they react knowing what they know" the general behavior of every character in one of Jigsaw's traps is to "forget everything you just witnessed and immediately do the dumbest possible thing before being killed." Oh, then there's the other "twist," which helps explain how a guy with cancer can set up such elaborate traps: Amanda is Jigsaw's accomplice (well, one of them. Let's just say that it doesn't explain it well enough, necessitating Hoffman's ridiculous involvement over the last four films). Eric Matthews is knocked out after dragging Kramer to the house (the last one on the left), and he awakens to find Amanda locking him in the same bathroom from the first film. Cue credits. 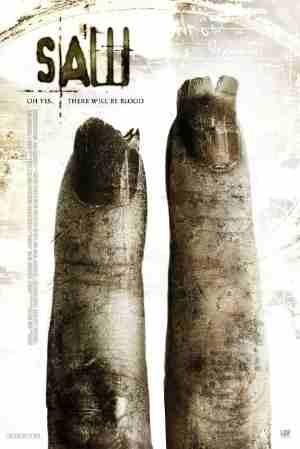 This brings us to Saw III, which brings back Matthews, who has the good sense NOT to cut his foot off (like Dr. Gordon did), but instead to smash his ankle so that he can escape being chained to the wall, although that's the last time we'll see him in this film. The first Saw cycle ends as Jigsaw is on his (as it turns out, literal) death bed. After killing off Detective Allison Kerry (Dina Meyer), the only cop to appear in all three films, Jigsaw and Amanda set their sights on Lynn (Bahar Soomekh), a doctor who might be able to keep John Kramer alive. In fact, she MUST keep him alive, or the explosive collar around her throat will detonate. For the Second Cycle, click here.